As I sit and write today's post I am so very Happy to tell you that our Sweet Baby Boy has arrived and sleeps next to me this very minute! It has been a whirlwind and please allow me to apologize now for any typos, misspellings, or any other errors as I am running on little more than 5 hours sleep over the last 5 days. He definitely keeps us on our toes! 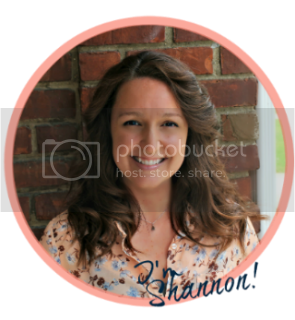 I am so very excited to share this project with you today. 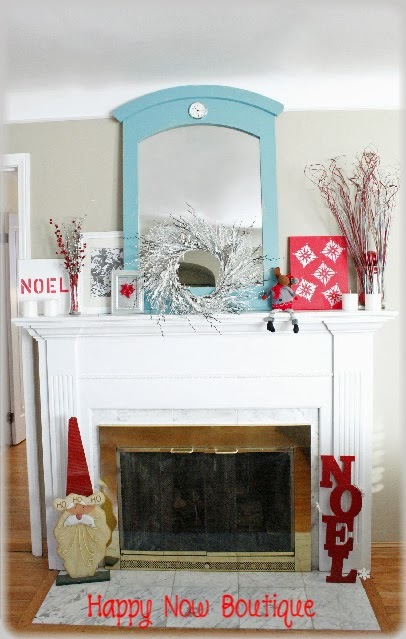 A very pretty and easy Budget Holiday Mantle! Let's get right to it! Now let's break it down! The canvas art is just an 11 x 14 Artist's Canvas from Joann which I found on sale in store. 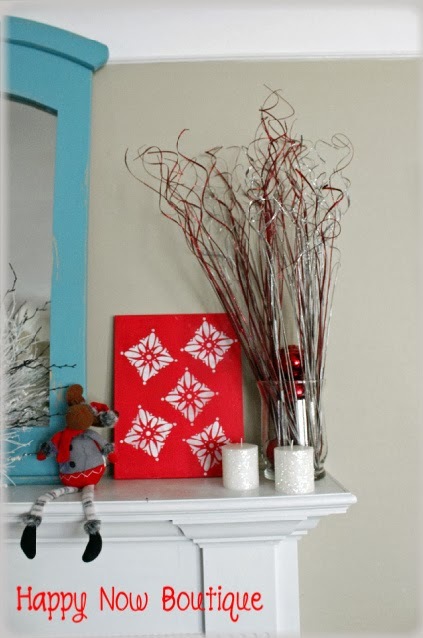 It has been painted in red acrylic paint and then stenciled with white paint. 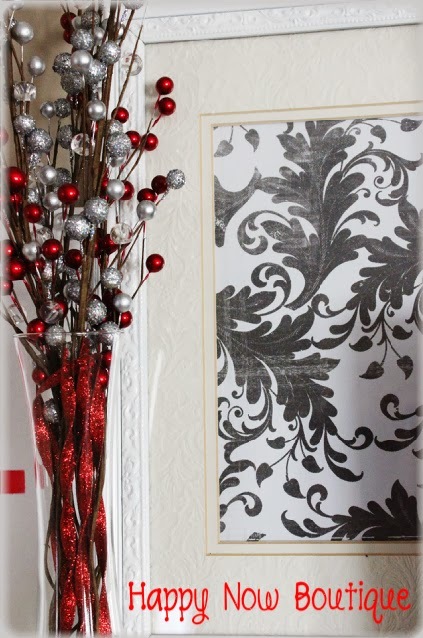 I had the stencils on hand as part of a Martha Stewart collection from Home Depot and I choose the one that looked the most Christmas-like. Ended up coming out like falling snowflakes. Pretty nifty, huh? 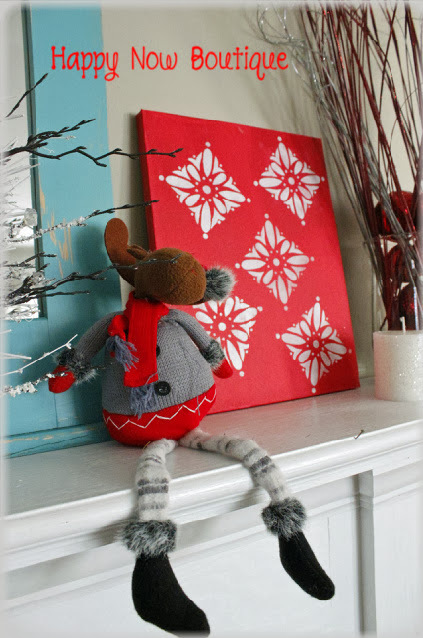 The stuffed mantle animal was a Family Dollar impulse buy from last year. Cute and went well with the theme. 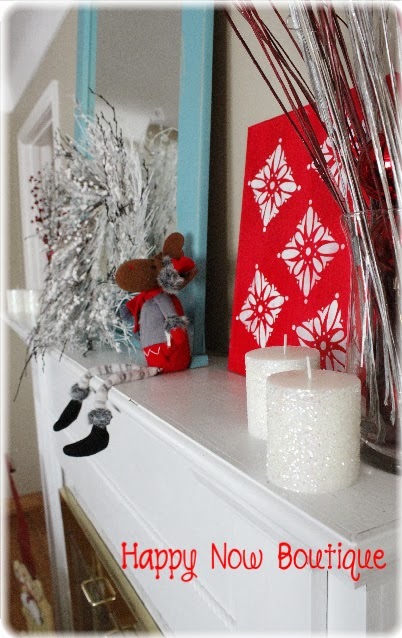 Another view of the canvas as it sits on the mantle. 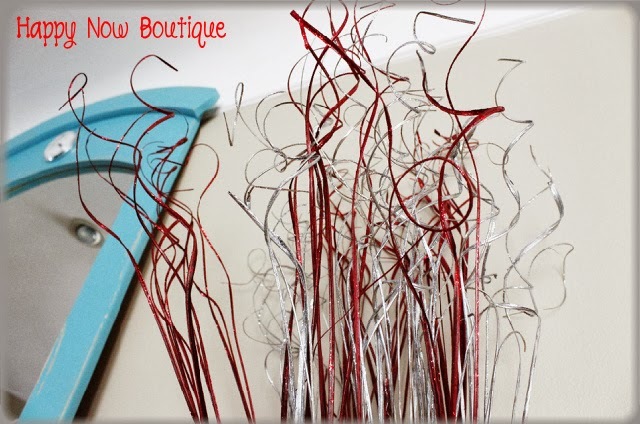 The glass vase arrangement is one of my favorite items from this project. 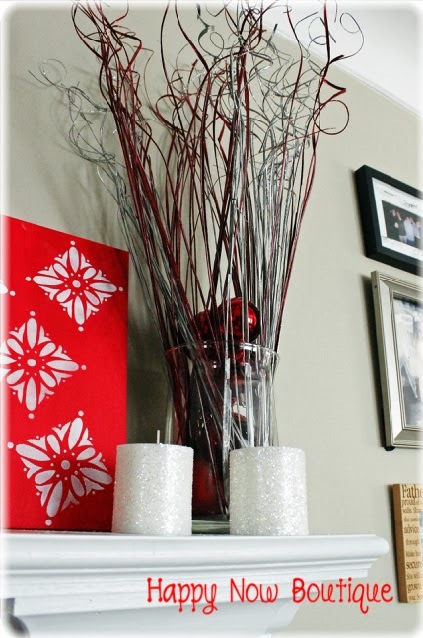 It was made using an old flower vase, red ornaments and corkscrew glitter branches from Joann's. 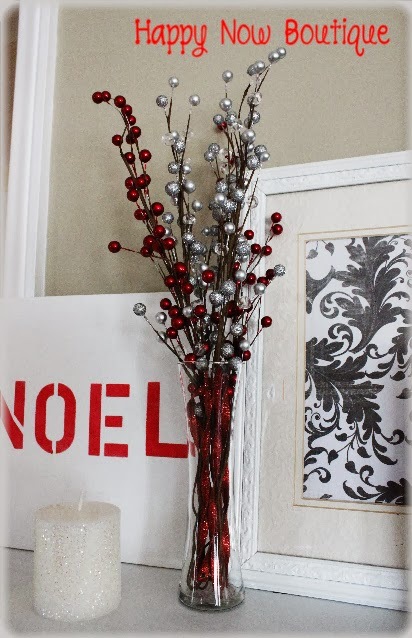 Simply add your ornaments to the vase and arrange the branches around the ornaments. Very quick and simple. 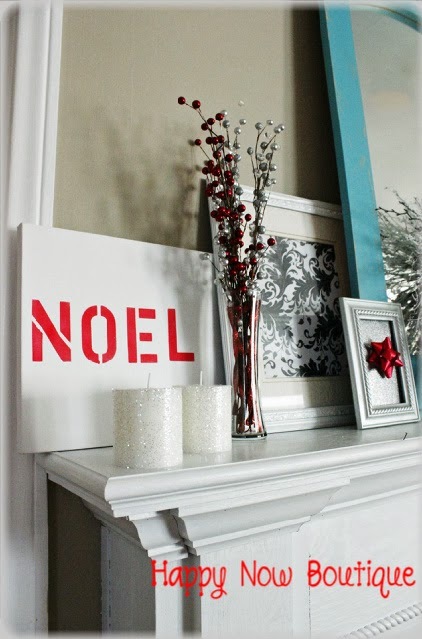 Another quick canvas project shown above is a simple, white canvas, again from the Artist's line at Joann's, this time featuring stenciled letters in red acrylic paint. Took less than 10 minutes! 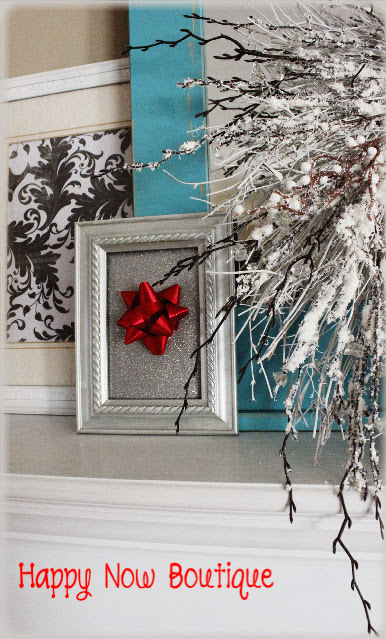 Some other quick holiday decor items can be as simple as taking craft-store scrapbook paper and framing it. 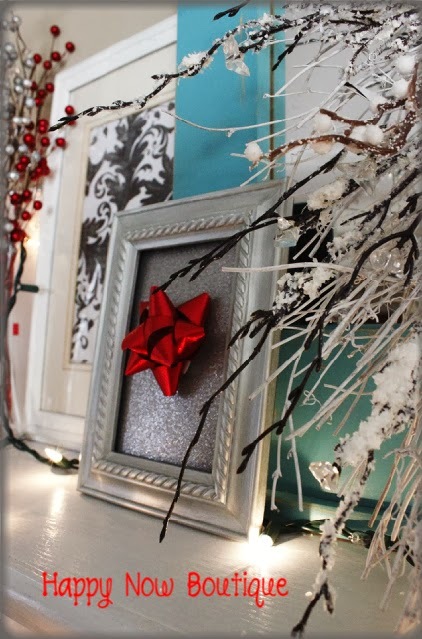 The black and white floral print went nicely with my white frame and the "present" art is a dollar store frame, painted in silver acrylic paint, with a sparkly, scrapbook paper insert and finished with a red present bow. The red and silver bulb branches were found on sale at Joann's and after bending the wire at the bottoms, they fit perfectly into an old flower vase. 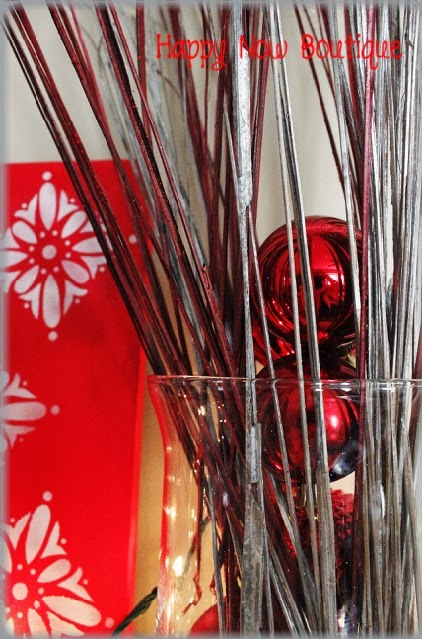 Some swizzle ornaments already on hand went into the bottom of the vase to hide the branch bottoms. A closer view of the branches. 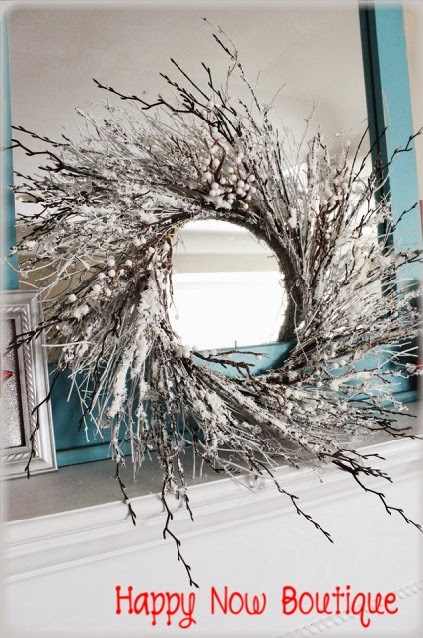 This is a pre-made wreath that actually came with our house. 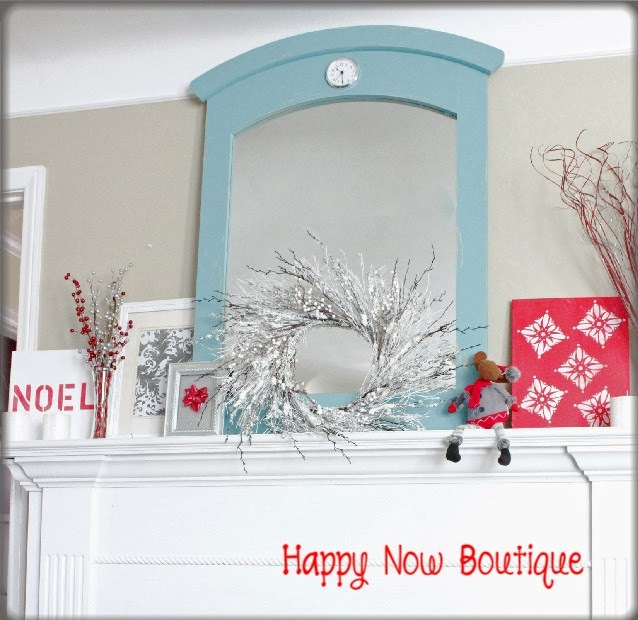 The previous owner's left it in the basement and I've always thought it was a perfect wintery decor item for Christmas and beyond. 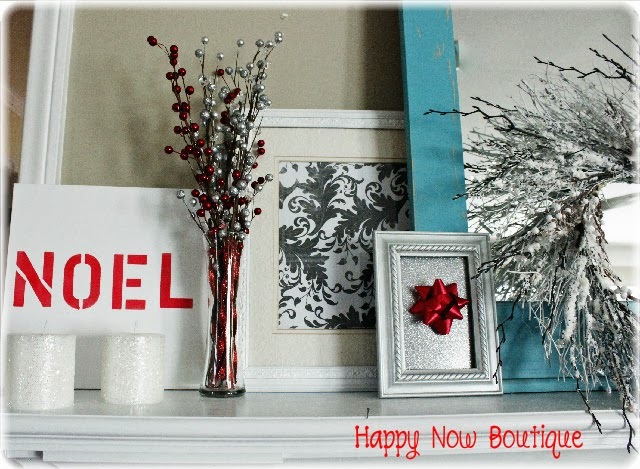 It added a nice touch to the mantle. Last, but not least, my sparkly holiday candles. You can find pre-made candles like this at pretty much any store, but at over $15 a pop on some, I decided to make my own. 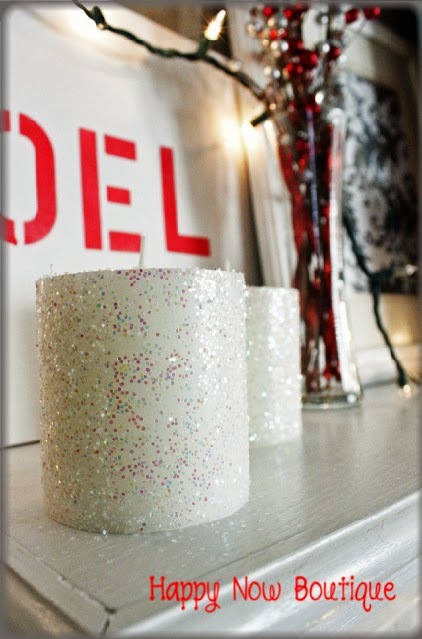 Literally as simple as taking a plain, white pillar candle and rolling it in glitter. 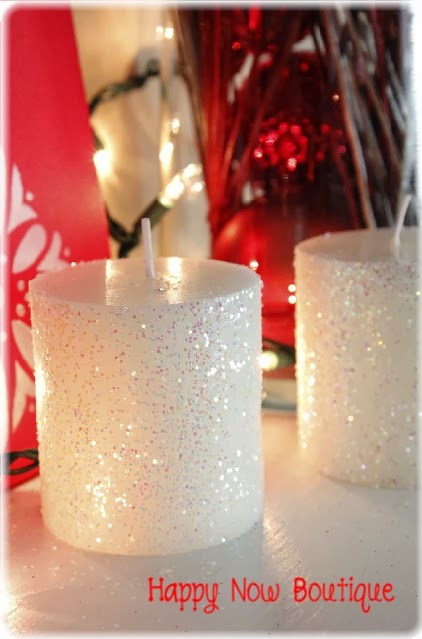 You'll want to use spray adhesive on the candle and then just roll away onto a plate of glitter. 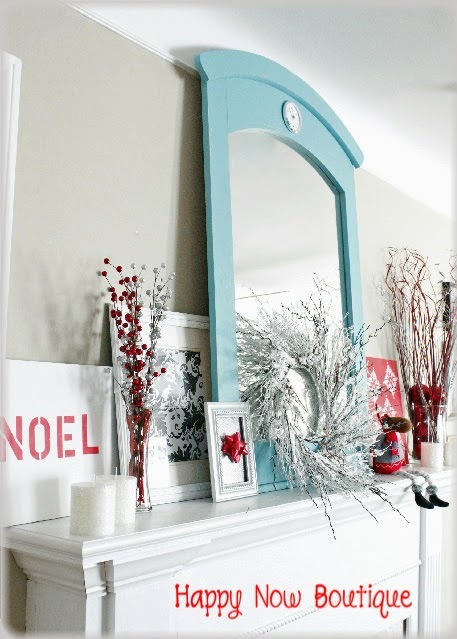 Pretty and super easy! Joann's offers excellent coupons daily via their smartphone app. Simply download it to your phone and store cashiers will scan it directly from your screen. I never leave home without it! That, combined with their every day sales and discounts can really add up to some great savings. 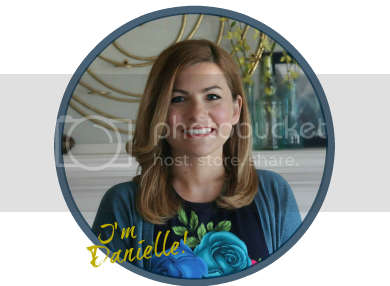 Let's take a few more looks at the finished results!